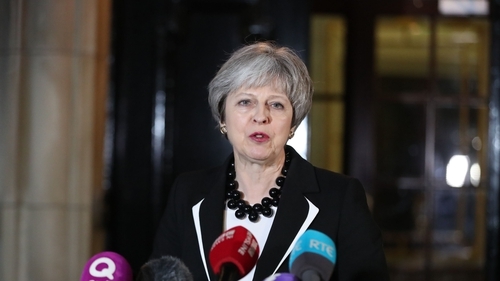 British Prime Minister Theresa May has said there is the "basis for an agreement" at Stormont and that an Executive could be "up and running very soon". Speaking at Stormont this evening following a meeting with Taoiseach Leo Varadkar and with the DUP and Sinn Féin, Mrs May said that "while differences remain, I think there is the basis of an agreement here". She added that she hoped that an executive could be "up and running very soon". Mrs May said the meetings had been "full and frank". She said: "It's been 13 long months since we last saw devolved government here and I think we are now at the point where it's time for the local elected representatives to find a way to work together and to deal with, to tackle, the many pressing issues facing Northern Ireland. "I've had full and frank conversations with the five parties and I've also met with the Taoiseach. "While some differences remain, I believe it is possible to see the basis of an agreement." Speaking to reporters at Stormont shortly before Mrs May, Mr Varadkar said that the DUP and Sinn Féin are working together in the hope of finding an accommodation which will allow the Northern Ireland executive assembly to get back up and running. The Taoiseach said he is hopeful a deal can be reached. Mr Varadkar said that the Government was in Belfast today to support both parties in their work. He said that he met Mrs May to talk about Northern Ireland and Brexit, and said that both governments are of the view that the agreement made back in December still stands. "The differences that exist between the DUP and Sinn Féin are not insurmountable, and we are very hopeful that those two parties will be able to come to an agreement this week, and then include the other parties," he said. "It is our strong view that an inclusive executive including as many parties as possible would be more sustainable and more beneficial for Northern Ireland as a whole," he added. He said both governments prefer "Option A" as the best option by which to avoid a hard border. He said that would be through a comprehensive free-trade and customs arrangement involving Britain and Ireland, and said both governments have an agreement to work together at a sufficient level to explore how that can be achieved over the coming weeks and months. Minister for Foreign Affairs Simon Coveney said that today was a very useful day and was an opportunity to reinforce the Government’s commitment to re-establishing power-sharing at Stormont. He said that he did not think is not helpful to talk about specific issues while the two parties are negotiating and it was up to the parties themselves to comment as they see fit. Sinn Féin leader Mary Lou McDonald has said her party does not believe there is anything insurmountable left to resolve in talks to restore power-sharing at Stormont. Ms McDonald was speaking after the Taoiseach and the British Prime Minister met with Stormont's main political parties amid growing speculation that a deal to restore the power-sharing government is imminent. She said that at this juncture what is required is political will to get the institutions back up and running in Northern Ireland. Ms McDonald also said Sinn Féin now wants to finalise a deal, saying the party is serious about functioning power-sharing. She added that it is clear that Sinn Féin and the DUP now need to meet, saying the parties will need to engage to bring a deal over the line. DUP leader Arlene Foster said progress has been made in the talks, adding that the DUP will continue to work to look for more progress. She also said that her party wants to "make sure what we get is a good deal for the people of Northern Ireland." Earlier a spokesman for Mr Varadkar said he and Mrs May would "assess the state of play in the negotiations between the parties". "The Taoiseach will use his visit to encourage the parties to reach an agreement so that functioning institutions can commence work again in the interests of the people of Northern Ireland," he said. A Downing Street spokesperson said Mrs May would tell the parties that her government is ready to introduce legislation to enable the re-establishment of a devolved Executive as soon as possible, if an agreement is struck. In a sign that the dynamic at Stormont shifted gears, the Taoiseach cancelled a scheduled meeting with Welsh First Minister Carwyn Jones in Dublin in order to head to Belfast. On Saturday, Sinn Féin's Stormont leader Michelle O'Neill said talks were likely to draw to a close this week. The DUP/Sinn Féin-led coalition imploded last January amid a row over a botched green energy scheme. Sinn Féin wants a stand-alone piece of legislation to protect speakers - an Irish Language Act - but the DUP has long insisted it would only countenance new laws if they also incorporate other cultures, such as Ulster Scots. SDLP leader Colum Eastwood warned that any deal to restore power-sharing must end the cycle of political stand-off between Sinn Féin and the DUP. "The real change necessary is an end to the cycle of two parties who have proved themselves very good at the art of political stand-off, but very bad at the responsibility of government," he said. "That is the joint DUP/Sinn Féin status quo that must now end. "Mr Eastwood added that when power-sharing is restored, focus must return immediately to the threat posed by Brexit, the economy and the crises in the health service and school budgets. The Alliance Party leader has said Sinn Féin and the DUP are "not quite there yet", but she believes that prospect of a deal being reached has increased dramatically. Naomi Long said it would be unusual for the Taoiseach and British Prime Minister to arrive in Northern Ireland unless progress had been made. Ahead of the meetings at Stormont, Mrs May met aircraft workers at Bombardier's Belfast factory in the wake of the company's trade battle victory in the United States. She toured the plant floor where the wings of the Canadian manufacturer's C Series jets are built. Bombardier's bitter trade dispute with Boeing had threatened jobs at the Belfast plant, but there was relief at the plant last month when a proposed 292% tariff on the US import of the jets was overturned by the US International Trade Commission (ITC) in Washington DC.